Most CRM software implementations state goals in software terms and not people terms. They apply design to software and not user experiences. They emphasize software ascetics over usability. They blindly add features and functions at the expense of simplicity and ease of use. Their project budgets favor investment for technology related tasks while skimping on change management and user training. They operate under the premise that if they build it, the users will come. Unfortunately, 25 years of CRM software implementation history suggest otherwise. Prioritizing technology over people has clearly contributed to the staggering and often cited CRM failure rate. Fortunately, there's a better way. IBM is the top global system integrator to sponsor and promote the User First approach to enterprise software deployments. This framework positions the user as the North Star and emphasizes objectives, efforts and outcomes in human terms. Here are the 8 User First building blocks that collectively mitigate pervasive implementation challenges (i.e. user adoption) and advance some of the most talked about but seldom realized high impact outcomes (i.e. user productivity). People goals. Successful CRM implementations start with successful goals, and successful goals start with empathy for our users and customers. Experience guru Stephen Andersen uses the below pyramid to illustrate a continuum from task-based output to people-based outcomes. 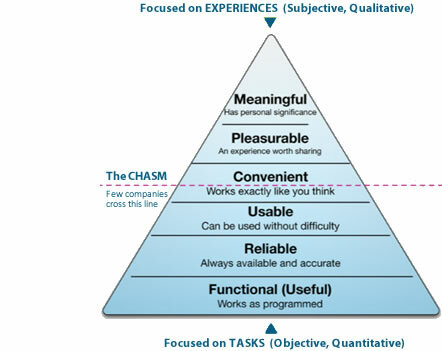 In order to cross the product to experience chasm, think of goals in terms of emotional or behavioral adjectives – such delightful, rewarding, memorable and a joy to use – that describe the desired user experience. Design Thinking is the best method to identify the highest impact user and customer goals, and to combine people-focused goals expressed as emotions with experience-driven design to deliver the ultimate user experience. Staff productivity. According to the McKinsey Global Institute report, sales people spend 19% of their time searching for information. On the flip side, SiriusDecisions reports that 60% to 70% of marketing's content goes unused because it's not found. The Docurated State of Sales Productivity Report shares that salespeople forfeit eight hours per week on non-productive activities such as CRM management and data entry. Interestingly, the problem and the solution are one in the same. For staff to be better off, and for the CRM system to be sustainable, the application must be able to increase user productivity. This can be achieved from new mobile accessibility, improved process automation (see next point below), delivering information in context, using guided behaviors to suggest next best actions, facilitating team based collaboration with enterprise social networks, and leveraging knowledge management for content sharing and repurposing information. Productivity enhancements should start by identifying tasks and processes that drain productivity. Simply configuring more software options that don't really contribute to time savings will result in the opposite effect. Looking at future trends can also provide opportunities for labor savings. Gartner forecasts that by 2020, the customer will manage 85% of the relationship with an enterprise without interacting with a human. Deploying customer self-service portals, online knowledge-bases and chatbots will both empower customers to serve themselves on-demand and relieve staff of high volume, low value activities. Business process design. On average, businesses change or update their business strategies every 20 months. However, they only change or update their business processes every four years. That creates misalignment, inefficient processes and user frustration. Staff productivity is enabled with technology, but not achieved with technology alone. Business process automation ― born from business process design ― is often the #1 contributing factor to increased employee productivity. The Component Business Model is generally a good place to start as it defines and designs end to end business processes that cross departments or lines of business. Once you have a holistic business process view you can prioritize and architect process optimization to reduce friction in processes, eliminate low value or non-value added steps, lower operating costs, achieve superior information reporting and improve outcomes. Automation replaces manual activities, accelerates business process cycles and incurs fewer data-related errors. More importantly, increased automation allows staff to spend less time on entering and fixing data, and more time using that data to better serve customers (more intelligently) and to make more informed business decisions. Business process design is often the single greatest contribution that will determine whether user adoption is enthusiastic, sluggish or challenged. User Experience. Anybody can get CRM software to run. But failing to deliver user experiences that make the users' lives easier, more productive and more rewarding is like saying that the operation was successful but the patient died. The user experience is different than the user interface. The latter is focused on aesthetics, while the former considers utility, effort, outcomes and satisfaction. Designing the user experience requires co-creation and a combination of process design and consumer technologies. Co-creation with users requires designers to know how users work and how they can work better. In addition to workshops, tools that can help include user surveys, Voice of the Customer apps and simple A/B testing. Consumer technologies make use of more white space, less clutter, mobile capabilities (touch screen, voice, swipe and gesture recognition), contextual commands, and dynamic information specific to the content at hand. They also enable collaboration among teams and communities, using collaboration tools such as enterprise social networks (i.e. Yammer or Chatter) that are linked to CRM entities such as accounts, contacts, opportunities, campaigns or cases. When consumer technologies are correctly infused into business applications the apps become so intuitive they can be used without lengthy training and software manuals. To achieve a rewarding user experience, you will probably need a UX designer to work closely with the business process designers. UX designers not only know how to blend consumer technologies with business process design, they recognize the inverse relationship between software features and the user experience. Too many implementers attempt to solve business problems by adding more and more software features and functions to the solution. More often than not, this actually makes the application more complex, difficult to use and less likely to deliver a rewarding experience. Think about the lessons from popular consumer technology tools. Social media sites like Facebook, commerce sites like Amazon and digital gadgets from Apple have clearly demonstrated that for a great user experience, less is more. Anybody can get CRM software to run. But failing to deliver user experiences that make the users lives easier, more productive and more rewarding is like saying the operation was successful but the patient died.